Born September 12, 1839, in Ballyshannon, County Donegal, Ireland, John Joseph Keane came to the United States as a child and grew up in Baltimore, Maryland. After high school he worked in commerce for several years before studying for the priesthood, first at St. Charles College, Ellicott City, and then with the Sulpician Fathers at St. Mary's Seminary, Baltimore. He was ordained in 1866 and became an assistant at St. Patrick's Cathedral, Washington, D.C. His duties there included preaching, preparing children for first communion, and presiding over the parish temperance society. Catholic education and temperance issues were to remain the focus of his efforts throughout his life. In 1878 he was named bishop of Richmond, Virginia. Appointed a member of the committee to organize a Catholic University for the United States in 1885 and one of four bishops charged with fundraising for the initiative, Keane was an early and active supporter of the university. Keane declined the initial invitation to join the committee in 1884 on the grounds that he had never attended a university, but after consenting to join he worked diligently to educate himself in university affairs. 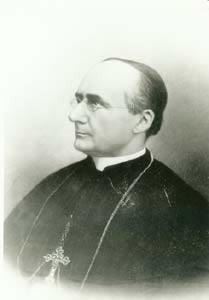 He was appointed first rector of the university in September 1887. Under his guidance the university's constitutional documents were drawn up and approved by the Holy See, fundraising efforts were carried out across the country, the first buildings were constructed and faculty and students were recruited. He left the university in September of 1896 and was called to Rome where he was named Archibishop of Damascus and a canon of the Basilica of St. John Lateran. In 1899 he returned to the United States to take up fundraising for the university once again. In 1900 he was named Archbishop of Dubuque, a position he held until 1911.